4.2 out of 5 based on 88 bloggers and 17 commenters. 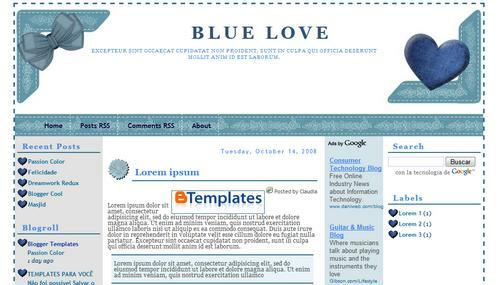 Blue Love is a free blogger template with 4 columns, magazine-styled, left and right sidebars, girly looking and vectorial elements. so sweet template. good accessory and colour. Nice template…I’ve used this as my blog templates, but how to show the editting icon in my blog directly?? Terima kasih atas sharing templatenya, Saya senang sekali bisa merubah tampilan blog saya. VERY GOOG THANK YOU !